What an amazing job you all did running to Canary. The route diversion and bikes were not so fun, and I know it felt long and hard. But you all made it and we are so proud of you! We leave for Milan in less than 3 weeks. I’m hoping that’s starting to feel a bit more like “YAY!” rather than “YIKE!” Or maybe a bit of both. We are in the home stretch and you guys are STRONG. If you had to, you could do the race now. The next few weeks are just about making it easier. Don’t worry about the cut off! From some of the chatter on the Canary run, it seems like there is a lot of stress about the cut off. This is the point where we need you all to take several deep breaths and just BELIEVE. Believe that your coaches know what they are doing, believe that it has worked for many others before you, believe that YOU can do it. Worrying takes a lot of energy. It is completely normal to be anxious before a run, but please try not to overstress or over analyze. If we thought there was even a CHANCE of you not being able to do this, we would be talking to you about it and planning for the possibility. Do NOT focus on what the race website says. We have talked to the race coordinator about our group (and trust me, there will be regular MWF runners who are slower than ALL of you) and they have assured us that the 3 hour cut off is not hard and fast. So we need you to do what you do during our long runs – just show up and do what we tell you to do. I know I said this last week but I’m going to say it again – make sure you try out any clothing or gear you might possibly use during the race. It could be warm in Milan, so get a pair of cropped running tights if you don’t already have them, or maybe even shorts (!!) and do a run with them. Make sure you’ve tried running in a short sleeve shirt, or maybe even a tank (!!). And no new running bra on race day, of course. This is the same for any water belt or whatever. Also try out your music options – you’ll want to bring headphones but won’t start out with them in since we will all be together and chatting 🙂 so where will you put them? And don’t forget to make a playlist. (really – one year I helped a friend in a panic on race morning because she thought she’d synched her phone with iTunes and it hadn’t worked and she hadn’t checked). As the trip approaches, Micki and Carolyn P will send more detailed emails about the weekend including timing and where to meet for meals, the tours, and anything else scheduled. They’ll also send some trip packing tips which I will emphasize and add to in a future email. If you have any questions at all about the race or the weekend, please don’t hesitate to ask. I know it can be scary not knowing how it’s all going to play out and we want to make you all feel as comfortable and psychologically ready as possible. I am missing the photo book information from a couple of you but you should have received a separate email from me on that. There are also 4 of you who have not done the dinner survey, also emailed separately. You all have a green check mark next to your name for race registration – wahoo! On Wednesday 13 March, we will be having an all-WRW coffee at The Elgin in Maida Vale, 255 Elgin Ave, W9 1NJ and you all are invited. It is timed to start after the regular MWF run, so about 9:30 – 11. We would love for you all to come because you are truly part of WRW and it will be a good chance to see some of the other runners who will be coming to Milan. Don’t forget to bring your Oyster card for the ride home. You won’t need your gels this week unless you really want the practice. This week, we are going to start running immediately from Barclays. In the race, you won’t have a walk to start running so let’s start to get used to running from the start. Make sure you are warmed up a bit before you get to Barclays and keep moving while we wait for the group to gather. 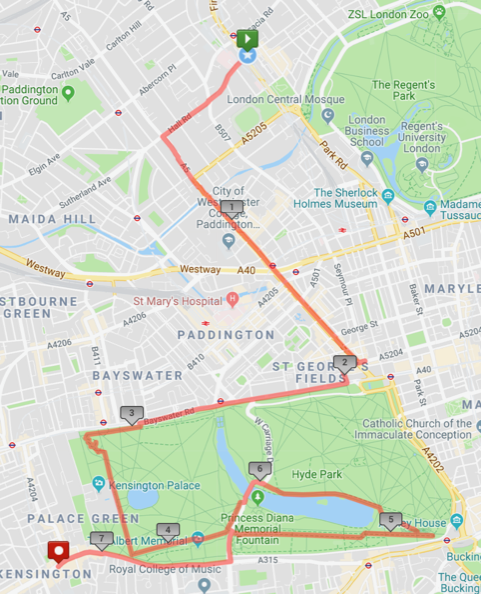 The route…The usual way to Hyde Park, all the way across the north side of the park and then down past Kensington Palace. Turn left to run along the south side of the park. At the far end, loop back to the left to run along the north side of the Serpentine, turning left at the Serpentine Gallery to cross over the bridge and run down to the south edge of the park. Turn right and finish the run at Dishoom.